Here we go again with more evidence of the fact that 2018 was a year of change in the Real Estate market. Price adjustments are another metric we keep a close eye on to see how the market is functioning. As Anthony mentioned in his September 2018 Opinion Editorial price adjustments were noticeably up all summer but now that the year has ended, and the data is final, it’s much more clear. As you can see some months were up dramatically, but the average for the entire year was up 14%- a large and undeniable increase. In 2017 there were 8,668 price adjustments, according to MLSPin, and in 2018 we saw 9,891. The highest months were May, September, and October which goes to show that sellers began to struggle before we all really noticed it in the summer and then it hit hard again in the fall. 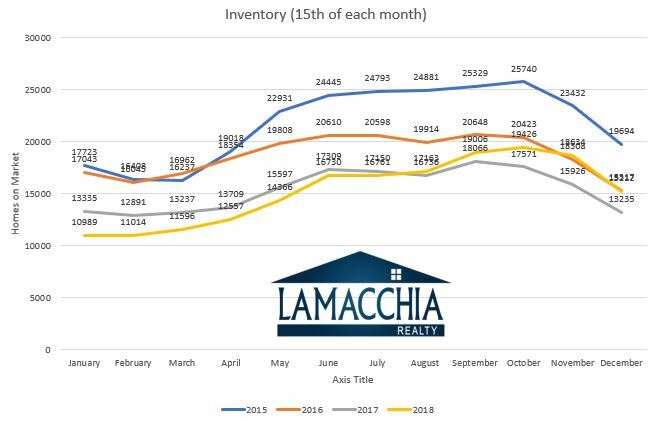 The market slows down either by the inventory of homes for sale going up or by demand going down or both. Sellers see what others sold for months prior under different market conditions and end up overpricing their homes. When this happens, buyers pull back and wait and we saw a lot of this in the summer of 2018. Homes almost always sell in the first 21 days of being listed or 21 days of a price adjustment so when you miss selling in that first 21 days it is very unlikely that you will be able to sell after that without adjusting the price to attract new buyers who are searching in a lower price bracket. Now that the market has adjusted and is headed for another spring market, it is especially important to get your price right from the beginning. Adjusting your price is a great strategy to utilize when your home is not selling but you are better off getting it right from the start in order to get the most money. When you do, you have more leverage because of your lower days on market. The lower your days are the more the buyer feels a sense of urgency and a sense of competition. The fact is you really cannot underprice your home just because of the way homes are listed nowadays. Homes sell for whatever they are worth. If they are worth more they get bid up. Last spring was the height of bidding wars and homes selling over asking price. This was rampant up until about June last year. The funny part that most sellers don’t realize is with most homes, the lower the list price the higher the sale price. The reason for this is the lower you list it for, the more buyers you attract, and the more buyers you attract the more demand you create, and the more demand you create the more the home sells for. It’s actually quite simple when you think about it. List in the winter when there is less competition. List at the right price from the start so you don’t fall victim to the 2019 price adjustment stats. List with the best Realtor and Real Estate company you can find. The third one is the one that is even more important this year. Why? Because the Fantasyland Sellers’ market is, for the most part, over now that the market has adjusted. The days of every home selling right away and for over asking are gone. Therefore, listing with a Realtor and a company that markets homes properly and are truly experts matters more than it does the last two years. If you follow these pointers you will sell for a good price and be happy!